Until I started doing the research for this series of blogs, I had no idea that "Rowdy" Roddy Piper NEVER wrestled a SummerSlam. But he was a part of a handful of events, whether it was on the announce team or making surprise appearances. In 1989 Roddy made his official return to the WWF by distracting "Ravishing" Rick Rude as he defended the Intercontinental championship against former champ The Ultimate Warrior. Piper's return was a surprise to me as this was an era long before the Internet and its plethora of spoilers. The interference helped Warrior win back his belt, but also set up a feud between Piper and Rude. The following two years Piper joined the announce team for SummerSlam. Hot Rod and Vince McMahon called the action in 1990. 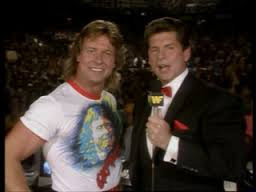 One of the memorable lines he had that night that stands out to me 25 years later was calling The Rockers (Shawn Michaels and Marty Jannetty) the Laverne and Shirley of the WWF. Then in '91 Piper was with Bobby Heenan and Gorilla Monsoon in the booth. 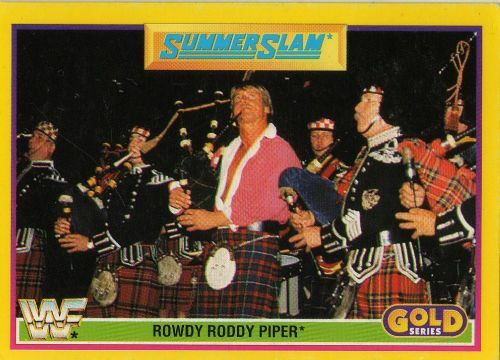 When Wembley Stadium in England hosted SummerSlam '92, Piper made a brief appearance, playing the bagpipes. He had faded away after his loss to Bret Hart at Wrestlemania 8 months earlier, so Piper's appearance was refreshing. This would be the Rowdy One's final SummerSlam sighting despite several brief returns to the WWE in the years that followed. Rest in peace Roddy. We love ya.